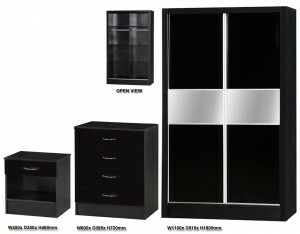 Hitting the mark in the modern style, the Alpha Gloss Bedroom Furniture will bring your bedroom interiors up-to-date, offering variant exquisite colours, ample storage space for clothing and accessories.Fabulous value bedroom furniture, the products are carefully selected from the Alpha Gloss Collection and priced that suits your pocket and needs, Simple and stylish with a clean sleek design and modern metal handles.Our sliding wardrobe have 4 compartments simply styled with a clean design and modern metal grooved framed doors, providing plenty of room for easy organisation of your favorite fashion essentials. get what you wear organised and easy to find with our aluminum sliding doors wardrobes ensure versatile and discreet use even in the smallest of bedrooms, they're great for walk-in closets or your hall helping you create your dream storage space. 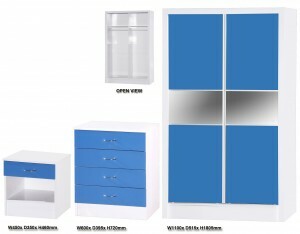 the compartments provide plenty of room for easy organisation of your favorite fashion essentials.The chest of 4 drawers that suits you, your clothes and knick-knacks.Ours come in styles that match our wardrobes and in different sizes so you can use them around your home, even in a narrow hall for maximum organisation. And as for our bedside table it's perfect for all your night time necessities they are handy for keeping your books, alarm clock and glass of water within reach. While also having a drawer for storing those cheeky extras that you don’t want anyone to see.